Blurb: Former Justice Department operative Cotton Malone wakes to find an intruder in his Copenhagen bookshop: an American Secret Service agent with assassins on his heels. Narrowly surviving a ferocious firefight, the two journey to the secluded estate of Malone’s friend Henrik Thorvaldsen. The wily Danish tycoon has uncovered the insidious plans of the Paris Club, a cabal of multimillionaires bent on manipulating the global economy. But Thorvaldsen also harbors a hidden agenda – a vendetta – that will force Malone to choose between friend and country, past and present. Starting in Denmark, moving to England, and ending up in the storied streets and cathedrals of Paris, Malone is forced to match wits with a terrorist for hire and to plunge into a desperate hunt for Napoleon’s legendary treasure, lost for two hundred years. It’s a breathless game of duplicity and death, all to claim a prize of untold value. But at what cost? Review: This book is the fifth installment in the Cotton Malone series. I have slowly worked my way through these books the last few years. They always pique my interest, with all the history involved, but I find them to be somewhat slow reads (which is why I probably only read one a year). In this particular installment, there was a lot of things going on. I found myself not as interested in the actual storyline as I was in the character development. There is a lot of growth, betrayal, and devastation within the characters of this book. Because of this I would not recommend reading this book without having read the previous books in the series. I don’t think you would appreciate some of the characters’ decisions without some background information. 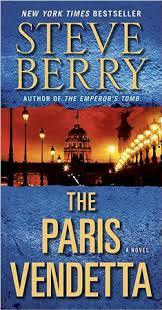 As always with Mr. Berry’s work, the book appears to have been meticulously researched. The writing was extremely good, the storyline interesting. Overall a great book that I did indeed enjoy. It’s just that I have hit a slump in my reading and unfortunately, I think this was the book that started that slump. But I was determined to read it because I knew it would be worth it in the end, it was just a long journey to get there. Overall, definitely a book and series I would highly recommend to those of you who love a good adventure with lots of history involved. Next postBout of Books … AGAIN!